16 August 2018 – The Goodyear Tire & Rubber Company is well-known as a leading producer of tyres. This global icon from America was founded in 1898 and is celebrating its 120th birthday this year. And while it has produced many breakthrough achievements and products over the years, Goodyear continues to innovate to help advance the next revolution in mobility. From the racetracks to the surface of the moon, Goodyear’s products are found in a multitude of exciting and compelling human achievements. “Few companies have left tracks intertwined so closely with key milestones in human history as The Goodyear Tire & Rubber Company. Founded at the dawn of the motor age, Goodyear took to the skies and eventually traveled to the moon. 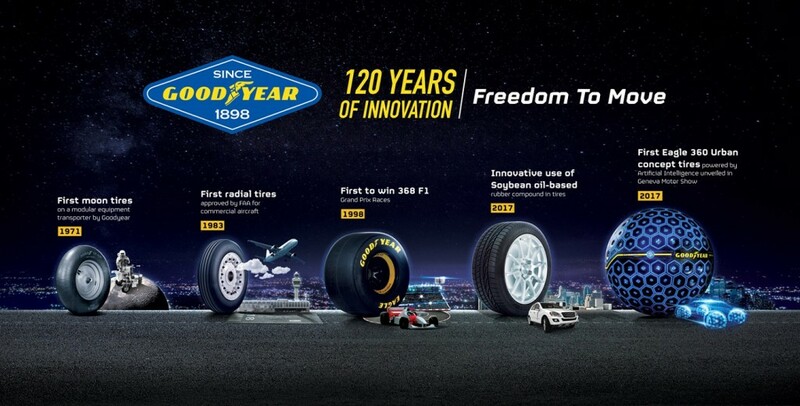 We are always at the forefront of innovation, dedicated to offering our customers and clients the Freedom to Move through superior products and services.” said Ryan Patterson, President, Goodyear Asia Pacific. In 1839, Charles Goodyear discovered a revolutionary invention that changed people’s everyday lives – the vulcanization of rubber. His namesake company has claimed many firsts, including tires on the first mass-produced car of the Ford Model T (1908); first pneumatic aviation tires (1909); first tires on the moon with NASA astronauts (1971). 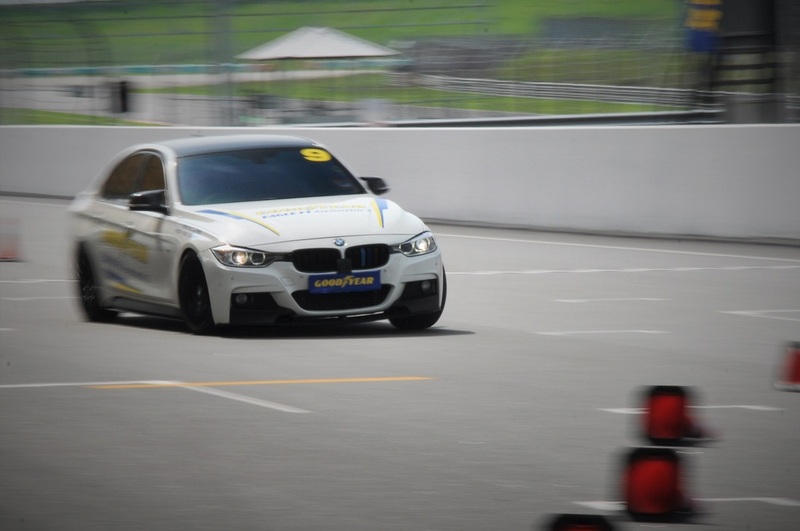 Throughout its history, Goodyear has been dominating across the entire spectrum of motorsports. In 1998, Goodyear won its 368th Formula 1 Grand Prix race, the most of any other tire manufacturer. For more than 60 years, Goodyear has been a fixture in NASCAR racing and is currently the exclusive tire supplier to the circuit’s top three series. Soybean Oil-Based Rubber Compound – To further commit to its product responsibility and sustainability promise, Goodyear established its first commercial use of a new soybean oil-based rubber compound. Goodyear’s team of resourceful scientists and engineers discovered a tread compound using soybean oil, which is naturally derived, cost-effective, carbon-neutral and renewable. By employing soybean oil in tires, Goodyear found a new approach to keep the rubber compound pliable in changing temperatures, a key performance achievement in maintaining and enhancing the vehicle’s grip on the road surface. Furthermore, this also promotes the importance of safe-driving, as the advanced tires are specifically used during dry, wet and winter conditions. Silica From Rice-Husk Ash – To highlight Goodyear’s commitment to the community, market place, and environment, Goodyear began using silica derived from rice husk ash to enhance traction and treadwear in selected consumer tires. Rice husk ash is an environmental-friendly and cost-effective alternative to the chemical compound. Sensors in Tires – Technology is becoming essential in our daily lives and Goodyear has innovated their products to meet the standards of today’s industry trends. Goodyear’s latest creation of sensor-equipped intelligent tires can continuously measure and record vital data that allows fleet operators to manage tire services. Real-time data is displayed into Goodyear’s proprietary algorithm, which enables fleet managers to monitor tire wear, temperature and pressure in real time. In 2018, Goodyear’s prototype was unveiled at the Geneva Motor Show. The Eagle-360, Eagle-360 Urban and IntelliGrip Urban – As artificial intelligence has been progressing over the years, Goodyear’s Eagle-360 concept tire is designed to enable the future of mobility, and was officially unveiled at the 2016 Geneva Motor Show. The Eagle-360, a spherical-shaped design concept tire, was designed with key features of manoeuverability, connectivity and biomimicry for autonomous mobility that allows the car to move in all directions. 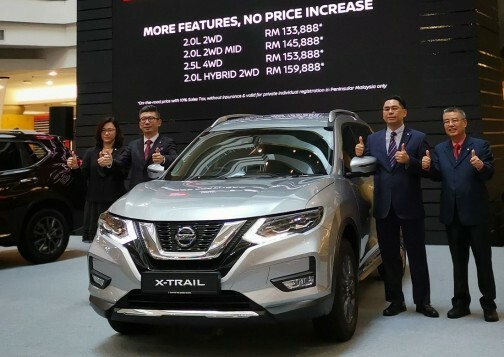 This contributes to the safety for passengers, as well as coping with space limitations such as tight parking lots or city streets.